Laura Vanderkam’s book “168 Hours: You Have More Time Than You Think” reminds me of a cross between Tim Ferriss’ “The 4 Hour Work Week” and Robert Pagliarini’s “The Other 8 Hours”. I love productivity books like these. Maybe it is because I realize that I watch way more than the average 4 hours of television per night and spend over the average 1.7 hours per day at my desk job checking my Twitter and Facebook accounts. Like many Americans, I am trying to use my time better. And, Laura Vanderkam’s book is really a great read to anyone who is trying to recapture those lost hours. There are 24 hours in a day, of course, and that translates into 168 hours in a week. How do you use those hours? Many people swear that they work between 50 and 60 hours a week. Lawyers and big shot executives have claimed to work almost 70 hours per week or more just to get ahead. But, actually scientific studies have shown that that simply is not the case. While many people may physically be at work for 12 hour days or more, many are not actually working all of those hours. In fact, we are very unproductive with our 168 hours that we have during the week, and Laura Vanderkam’s book “168 Hours: You Have More Time Than You Think” brings the problem into focus and offers some great actionable solutions on how to fix the issues. Laura Vanderkam’s book is divided into four sections. Part One shows you how we Americans really spend our 168 hours every week based on the American Time Use Survey. The section also delves into understanding your core competencies of your life and your job. If you know what you are truly good at and enjoy doing, then you can focus your life and your career aspirations on that. Part Two is all about your work. It helps to show you whether or not you are in the work you love and gives tips on how to get to that work if you are not there yet. The three chapters in that section also talk about controlling your work calendar. Part Three deals with your life at home and how you can have a full, rewarding, and successful career while still enjoying your children and home life. And, finally, Part Four of the book deals with putting it all together. It shows you that there are enough hours in the day and in the 168 hours of the week for any task that matters enough in your life. There are worksheets to help you fill out your 168 hours and other tips as well. 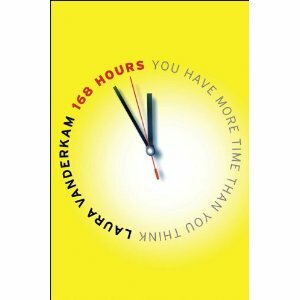 Laura Vanderkam’s book, 168 Hours, is stuffed full of excellent ideas and actionable solutions to your time management problems. There are a few exercises as well. Now, do not go breaking out into a sweat thinking that Vanderkam has given us all homework. I can tell you that going through these little tasks were a complete eye opener. Of course, one of the biggest tasks that she asks her readers to complete is to log your time. By tracking how much time you spend on certain tasks, it will open up your eyes to how and where you waste most of your time. It is the same concept of tracking every penny you spend for a month in order to see where all your money goes and find the leaks in your budget. The book has examples of spreadsheets for filling out your time use survey, and you can even download one from the book’s companion website at My168Hours.com. Another assignment from the book that I absolutely loved was creating you list of 100 Dreams. This is sort of like a bucket list. The exercise helps you find out what you love to do, helps you find out more about yourself, helps you understand what drives you, helps you find your passion, helps you narrow down your passions to help you find out what you want to be when you “grow up”, and can really give you drive in your life to make it the life that you really want to live. Writing down a list of one hundred things that you would like to do or accomplish in your lifetime was surprisingly hard, but I thought that it was well worth the effort. It took some time to complete, and in fact, I’ve only figured out what about 92 out of the 100 things actually are. I’m adding more every day. You can check out my List of 100 Dreams. Other tasks talked about in the book for you to tackle are identifying your core competencies, finding out what to ignore, minimize, or outsource in your life, and fill bits of time with bits of joy. Almost everyone can probably learn a few things from this book. But, I think that people who are self-proclaimed workaholics are the ones who will benefit the most from having read this book. If you feel like there are not enough hours in the day, let alone your week, than this is the book for you. I am very choosy about the books I spend my time reading. I have a bookshelf full of hundreds of personal finance, investing, and productivity books. There are very few that I read cover to cover, and there are even less that a break out my highlighter for. Laura Vanderkam’s book 168 Hours is yellow through and through. I highly recommend it to anyone who is looking at taking control of his or her life back.